Will there be a ‘grand alliance’ of the Opposition ahead of the 2019 Lok Sabha poll? As of now, many opposition parties, including the Congress, feel that it could only be a post-poll arrangement. For instance, Nationalist Congress Party (NCP) chief Sharad Pawar told a news channel recently, “A mahagathbandhan prior to the election (Lok Sabha) is not practical.” The Communist Party of India (Marxist) declined to have an alliance in all the five poll-bound States and its General Secretary, Sitaram Yechury, said the ‘grand alliance’ could only be after the polls. The Aam Aadmi Party (AAP) has decided not to join any alliance in 2019. Samajwadi Party (SP) chief Akhilesh Yadav announced that they couldn’t keep on waiting for tie-up with the Congress in Madhya Pradesh. The last word is yet to come from Bahujan Samaj Party (BSP) chief Mayawati. Though she has abandoned an alliance with the Congress for the ensuing Assembly polls, she has not said anything about the Lok Sabha poll. supremo Mayawati, NCP chief Sharad Pawar and Rashtriya Lok Dal’s (RLD) leader Ajit Singh. But subsequently, the mahagathbandhan idea, for now, has turned sour. What has gone wrong in the meanwhile? Union Finance Minister Arun Jaitley has described it as an anarchic combination, the likes of which were “tried, tested and failed” in India. Indeed there are inherent contradictions. The opposition parties concentrate more on chemistry than arithmetic. The question that arises is: What role will the Congress play? The party which had ruled the country for over 50 of the 70 years since Independence, is yet to shed its nostalgia of its mighty past and be more accommodative in seat sharing. The Congress needs to yield place to the regional allies where they are strong. Also, the opposition parties, too, should be realistic in their demands for seat sharing. Congress president Rahul Gandhi had stressed the importance of two levels of alliances — one at the State-level, and the other and more important, at the national level. The State level alliances have not taken off as expected so far. In fact, there is so much Opposition disunity in ensuing the Assembly polls. Moreover, the Opposition is losing faith in the ability of the Congress to lead. Mayawati says that the Congress is not yet battle ready. The Congress does not want to deal with the AAP. The Shiv Sena will not be acceptable in the Maharashtra tent; the Trinamool Congress will have no truck with the Left parties in West Bengal; and the Dravida Munnetra Kazhagam (DMK) and the All India Anna Dravida Munnetra Kazhagam (AIADMK) are on opposite sides. Interestingly, the SP and the BSP have come together. Some regional parties, like the Trinamool Congress, the Telangana Rashtra Samithi, the Biju Janata Dal, the SP and the BSP, would like to isolate the Congress and form a third front but there can be no grand alliance without the Congress as it would be an advantage for the Bharatiya Janata Party (BJP). The Opposition needs a new slogan as well as a strong leader who can unite it. As a tried and tested leader, Sonia Gandhi is a better bet as she is more acceptable but she has taken a back seat and handed over the baton to her son. Even now, if she comes forward to unite the Opposition, it might succeed. Interestingly, a recent poll survey conducted by the ABP News-C Voter claims that the National Democratic Alliance (NDA) would win a majority of seats in most States though Punjab, Maharashtra and Uttar Pradesh could show some resistance if the Opposition got united. It predicted that the NDA would get 38 per cent vote share while the UPA 25 per cent and other parties 37 per cent vote share. 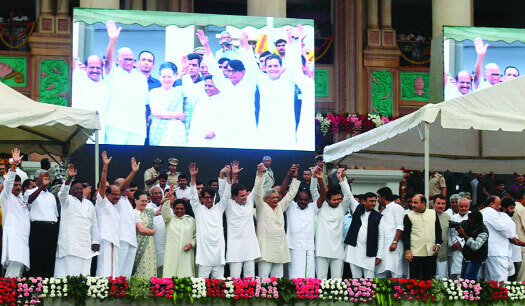 The survey claims that if the Congress-SP-BSP combine together in Uttar Pradesh, the BJP would suffer a heavy loss. The Congress is enthused after another ABP News-C Voter survey, which has predicted that the party may return to power in Madhya Pradesh and Chhattisgarh and will make a comeback in Rajasthan. Win or lose, these Assembly polls will be a dress rehearsal for 2019. However, unless there is a direct fight between the BJP and the united Opposition, it will be difficult to dislodge the BJP. Though Congress president Rahul Gandhi is optimistic that a ‘grand alliance’ would become a reality, but there are many ‘ifs’ and ‘buts’ before that. Ultimately, if the people want to get rid of the BJP, they will look for an alternative. That alternative is yet to emerge because of a divided Opposition and too many ambitious leaders. As of now, Prime Minister Narendra Modi is still popular and the there is no alternative (TINA) factor that may help him to return to power. However, in politics one week is said to be long enough and there are at least six months left before the poll.